Today was the 200th anniversary of the beginning of the War of 1812. Many uninformed souls claim that it was June 18th, but the Proclamation is dated on June 19, 1812. Have a look…. US President James Madison signed the War Bill June 18th after passage through the Senate the previous day. Earlier, on June 4th, the House passed the War Bill 79-49, which was debated by the Senate for two more weeks. The Senate passed the War Bill 19-13 along party lines. The stated reason was the impressment of US citizens into the British navy; British ships stopping and searching American vessels; the British naval blockade, by which United States’ “commerce had been plundered in every sea”; the British Orders in Council; British inciting of natives on the western frontier against the United States, a clear violation of U.S. neutrality laws. Ironically, it was on June 16 that Britain finally repealed the 1807 Orders in Council, the primary cause of the War of 1812. The Orders in Council authorized the Royal Navy to bar all shipping and trade with France and her allies. War had been in the air for years, and after the election of the so called “War Hawks” in November, 1811, it was inevitable. In Upper Canada, Major General Isaac Brock (Administrator of Upper Canada) had been preparing for this inevitability. More about that later for it was a crucial step that paid huge dividends later on. His words were generally true, but some things the Americans intended actually turned out to thwart their efforts. I really have neglected this. The declaration of war is about a month away and I am still stuck in 1791. What happened in 1791? To accommodate approximately 10,000 English speaking loyalists that arrived following the American Revolution, the British parliament carved out the middle third of the Province of Quebec (1774) and established the Province of Upper Canada. The province was originally divided into four districts: The Lunenburgh District, renamed “Eastern” in 1792; The Mecklenburg District, later “Midland”; Nassau District, later “Home” and the Hesse District, later “Western”. Interestingly, for the last 220 years, these divisions have been continually evolving, changing names and boundaries. The capital and site of the first parliament was Newark (Niagara-on-the-Lake), originally settled in 1781 by Col John Butler, and was a haven for loyalists. The first session of Parliament in this province was also held in a tent nearby and made history by passing the Act Against Slavery, on July 9, 1793, becoming the first jurisdiction in the British Empire to do so. The seat of government was soon moved to York, as war with the Americans was anticipated as early as 1794. Originally Simcoe planned for the capital to be located at the forks of the LaTranche River in the Hesse District, later to become London. Hmm.. this was supposed to be my next post on the history of Upper Canada, creating the setting for the War of 1812, but I haven’t written it. And it feels like this recurring dream in which I am back in school sitting down to an exam for a class I forgot to attend. I gave it a lot of thought but it was too big of a topic. Then work became quite busy, and still is (for which I am very thankful). How do I summarize the colonization of the area by the British? Think of the Quebec Act of 1774. It was more of an attempt to keep French Canada happy despite the rumblings of the English colonies to the south. The territory was 3 times the size of the original French province and included what is now Ontario plus several states around the western great lakes. Of course the Americans were impressed. Actually, they had some rather grand ambitions of their own and wanted the territory for their own purposes. Eventually they got their wish and began to exploit it as only they know how, ticked off the inhabitants, creating a backlash and fear that played right into British hands in 1812. Once the American Revolution was over, the British ceded all the lands south of the great lakes. Or rather, when they were forced to. Niagara and Detroit were decent forts and there was nothing to speak of across their respective rivers. But eventually the Americans settled and occupied these places, leaving the British with some work to do. This included creating a more “British” community in the sparsely populated western part of Quebec. The French were, of course, the first Europeans to settle in what eventually became Upper Canada. The history of French exploration and settlement in this area is a vast subject and I simply can’t be bothered to get sidetracked. And I could… but I won’t. In 1610, the young Etienne Brule (1592 – 1633) was the first European to see the Great Lakes and at the request of Samuel de Champlain was sent to live with the Hurons. (not Huorns, the malicious, sentient trees of Middle Earth, a long, long way from Upper Canada). Around this time, adventurous fur traders would begin to work their way across the continent. Not much is known of their early pursuits. Champlain followed suit in 1613 taking the Ottawa river and crossing over to Georgian Bay and south to Lake Simcoe (also to stay with Hurons). The alliance between the Huron and French against the Iroquois and British would last for the next 150 years until Wolfe defeated Montcalm in 1759 and all of what is now Canada became British. The Jesuits arrived in 1626 and built Sainte Marie among the Hurons in 1639. It was the largest European settlement west of Montreal. The mission lasted until 1649 when the Iroquois raid became too much. The mission was burned and the Hurons were eventually displaced to the west. A well-known Christmascarol was written there. In 1673 the first fort on Lake Ontario was built at the present site of Kingston. Fort Frontenac was the first in a chain of forts stretching to the eastern prairies and the Mississippi, supporting the growing fur trade. Among them were Fort Niagara (1678), Fort Pontchartrain du Détroit (Detroit 1701), Fort Michilimackinac (Mackinac Island1715), and Fort Rouillé ( Toronto 1750)… they all played a part in the war of 1812. 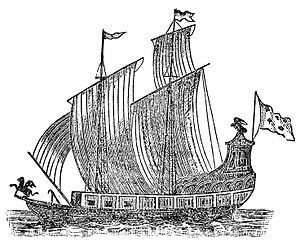 In 1679 René-Robert Cavelier, Sieur de La Salle built the first large sailing ship to sail the upper great lakes in search of the passage to China. Just south of Niagara Falls, NY, La Salle’s men built Le Griffon, a two-masted 45 ton Barque. La Salle set out on August 7, 1679, picked up some men on the 10th near Detroit, finally arriving in Green Bay, WI on September 14. La Salle and his men stayed behind while a few departed for Niagara on the 18th. It was never seen again. Until just recently, that is. Explorers may have found the wreck but lawyers live in a world all their own doing things that, unfortunately make life difficult for many. So we may never know… there can be no announcement. This part of the continent that we call Ontario did not have thriving settlements, a local government or even a name. Ontario was a lake. Canada was the French colony along the St Lawrence. This area was called the Pays d’en Haut. This is getting rather boring, and has very little to do with the War of 1812. Except that the French settlements and forts became the sites of some major engagements in the War of 1812. In 1759, the nearly constant war between the British and French was over, as far as Canada was concerned. Not too long after, the British made a few political gestures to agitate some of her colonies. And a little later, this constant fighting with the French (this time Bonaparte) had an unintended consequence. The cover of this issue really interested me (big surprise there). Useful map inside, too. It turns out to be a story of War of 1812 reenactors, and it is the Battle of Chrysler’s Farm…. which they claim is the decisive battle of the war. We’ll see more in about 18 months, but the Americans lost that campaign before they even started. The original inhabitants of Upper Canada are no more. Actually, there is a little more to it than that. In fact, there is a fairly detailed and complicated history on this, but ultimately the original Iroquoian peoples of Western Ontario were attacked and displaced long before any Europeans settled in the area. The Huron or Wyandot lived on the southeast coast of Georgian Bay and the Lake Simcoe area. These were the guys with the cool haircuts. Traditionally they were opponents of the 5 Nations Iroquois Confederacy to the east in the Finger Lakes area of NY State. The Petun lived just to the west of the Huron and were into tobacco. The Neutrals or Chonnonton lived north of Lake Erie and Lake Ontario, and at one time were the largest aboriginal nation in the northeast. Pretty much the only Neutral word that has survived to the present day is “Niagara”. The excelled at agriculture pursuits (growing corn, beans and squash together is highly recommended) and even had a thriving deer industry, likely attempting to domesticate them. They were not exactly pacifists as their name suggests, they simply remained neutral in the power struggle between the Huron and the 5 Nations Iroquois. Much like the Swiss, sans cheese and chocolate. All were on friendly terms with the Ottawa, an Algonquin-speaking nation living on the Bruce Peninsula and areas to the north. The Beaver Wars changed all that. Picture Saruman taking over the Shire in Lord of the Rings (from the book, not the movie. Not sure why Jackson left that part out, it’s not like the movies were too long or anything. I mean, they just have done with him halfway through the trilogy. One of the best scenes of the book is the one where Grima throws a “rock” out of Orthanc at Gandalf, not knowing it was Saruman’s Palantir… ). In 1648, the Dutch and English began arming the 5 Nations Iroquois who in turn attacked and displaced the French-allied Huron and Petun. The next year they turned their sights on the Neutrals who were almost entirely wiped out and whoever was left were assimilated. The Iroquois kept on expanding until they dominated a huge area much like the old Soviet Union, and somewhat more democratic. They were mostly after hunting ground, and did not seek to settle the area. That came much later. So the land was largely uninhabited into the 18th century. Into the vacuum, however, came some Ojibway from the north who called themselves Mississauga and settled on the western end of Lake Ontario. By this time the Beaver Wars were over. I have thought about starting this blog for a couple of years now. You could say I have been interested in the War of 1812 for several decades, but now that this year is the 200th anniversary of the War of 1812 I suppose I had better get started. In fact I could have started last fall documenting events leading up to the war, but we still have some time. It didn’t start until the summer, but key events took place in Upper Canada prior to that. I am not much of a writer, nor much of a blogger. I am not a trained historian, in fact I haven’t formally studied Canadian history since grade 9. So if you find this a tedious read, I apologize. The are many excellent resources online that cover this topic. I haven’t yet read very many of the recent books that have been published on the subject, and I certainly will not be participating in any re-enactments. But I am delving into some primary sources and visiting places on the way. Should be interesting. It’s about Upper Canada – the western part. That is where I grew up and it is where I live. The majority of the battles, people and events in this war took place between Toronto and Windsor, mostly in the Niagara peninsula. More than half the casualties of the war occurred within 20 miles of the Niagara River. It’s about the war of 1812 – Most famous are the Battle of Queenston Heights and the Battle of Lundy’s Lane. But there are dozens of lesser-known battles, skirmishes and action that took place here as well. The Battle of Burlington Beach was neither big nor decisive and few have heard of it, but I will take a look at it. It’s about people – more than just Tecumseh, Isaac Brock and Laura Secord. There little known individuals whose actions changed or nearly changed the course of history, like the amazing John Norton, and the nasty Andrew Westbrook. It’s about places – like the well known Laura Secord Homestead. But there are scores of other locations that figure prominently, many of which are well know to the local people. The windy road up Hungerford Hill in London was the site or 1 or 2 skirmishes that are well known locally, but not much has been written. The hill is now called Reservoir Hill and the road is still called The Commissioner’s Road 200 years later. And it is still windy. It’s about events – other than battles, there were meetings, musters, building and burnings. Washington DC was burned by the British in retaliation for the burning of York (Toronto). However, York was burned in retaliation for the burning of another American town. And so on. Maybe we will find out who started it the burning. And it’s about what I have learned along the way.